Which of these banners do you like best? Your opinion matters ... so please let me know which one you like best! Hi Friends ... we are home. Can you tell we were away? Our little family packed the car and drove 850+ miles south to spend some time with our family and friends. We just got home a few hours ago ... that was another 850+ miles north, mind you. The car is unpacked, stuff put away, clothes are in the washing machine, fireplace is lit, and lunch has been eaten. Now it's time to take a much needed rest. In the meantime ... I thought I would share these two pictures that I took in early November. The Salvation Army Bell Ringers were out a little earlier than normal this year. This amazing woman was the official bell ringer at our local Walmart. She was a wonderful singer and she played her instrument. We were so lucky to be able to experience her gift. Each time Griffin sees a red bucket, he asks for my change. He also does it at McDonald's for the Ronald McDonald House and at the grocery store where they collect money to help feed the hungry. I think I have a very sweet, wonderfully charitable little guy on my hands. 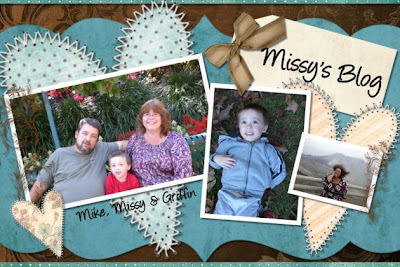 I can't wait to share pictures of our family & friends, meeting blogging friends and Sea World. Honestly, I probably have about 500 Sea World pictures ... I guess I'll have to choose which of those to share. We had a wonderful Thanksgiving ... we went to Sea World!! And then today I met fellow bloggers Andi, Bonnie, Cecile and her mother Martha for lunch!! It was awesome! I will be blogging about both of these events in detail soon. What do you think of my new background and blog header? I'm getting a little spoiled because my MIL has a high speed internet connection and I can do things super fast as far as my blog goes while we are here! 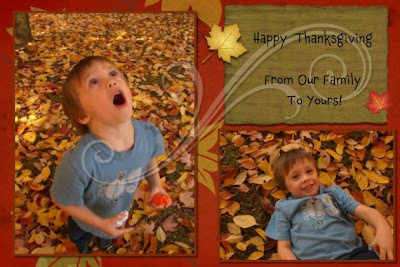 Mike, Griffin and I are wishing you a wonderful and happy Thanksgiving! This picture has nothing to do with today's post ... but really, what is a post without a picture? This is Sarah, my mother-in-law's black lab ... she was ready for a ride on the golf cart. I've decided not to do the Pre-Made Blog Banner Blog ... it's just not me. I enjoy making them for friends and for myself, but that's it. So, I deleted it. I still have my Paper Piecing Blog (you can find the link to the right) and I will most definately still sale on Ebay. Mmmmmm ... I have been skinny dipping. I don't know why I didn't highlight that one. Ladies ... does that mean I've lived??? LOL!! I've been turkey hunting with Mike in Texas. He's the one that actually bagged the turkey and I helped him clean it. Does anyone care to guess how you remove the feathers? It's too disgusting to share! Bonnie, I can't believe you can't remember when we "sort of" hitched hiked. I know we've talked about it since I posted it ... but remember when we ran out of gas over near Sonny's BBQ? We were walking to the gas station and this really nice woman stopped to pick us up and said we shouldn't be walking along the road? We looked at each other like should we get in the car since we didn't know her ... we decided it was better than walking. She was playing Christian music on the radio and she even waited for us to fill up the gas can we borrowed from the carpet business and took us back to the car. That's why I call it "sort of" hitch hiking because we didn't instigate the ride. My mother-in-law Bett hosted her annual Thanksgiving Party on Sunday. It was wonderful ... so many family members and friends came. There was so much good food and good times ... it's my absolutely FAVORITE day of the year! My sister-in-law Bonnie made these darling pumpkins made out of cheese ... they were the hit of the party. 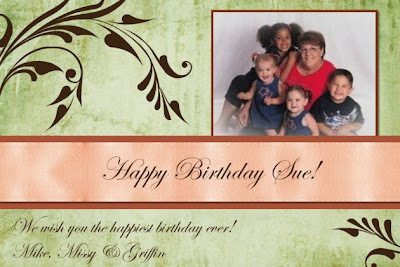 I think she said she found the instructions on Susie Q's blog. I did not turn this picture around because I do not have the software I need to do that just now. Sorry about that. Here we find Mike frying one of the two turkeys he fried. Yummmmm!! If you've never had fried turkey, you just do not know what you are missing! Saying cheese ... my brother Jerome and my sister-in-law Bonnie. My brother-in-law Ray (Mike's brother) and his girlfriend Terri. Me and my wonderful sister-in-law Bonnie. Mike and my amazing brother Jerome. I have to tell you ... he and Bonnie came bearing gifts for us. They are just so, so sweet. I will take pictures of the awesome things they shared with us soon! And finally ... our little fella. 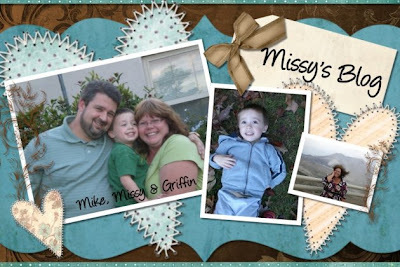 The two loves of my life ... Mike and Griffin. We had a wonderful Thanksgiving ... we are so blessed to have so many amazing people in our lives that we can share this holiday with. Bett always has her big Thanksgiving get together the Sunday before Thanksgiving. The Saturday night before we would get together at Bett's house to start getting things ready for the Thanksgiving party she had the next day. One of her mother's (Grandma Ida Mae) responsibilities was peeling the boiled eggs that we would use for the deviled eggs, gravy and whatever else we needed boiled eggs for. As it was difficult for Grandma Ida Mae to get around, she could still sit at the kitchen table and be part of what was going on. When Grandma passed away several years ago, we kept the tradition of the egg peeling going on. I remember the first Thanksgiving without Grandma was very hard, but it was wonderful talking about her and remembering how much she enjoyed sitting there peeling those eggs ... just enjoying it all. Since moving to Virginia, we always look forward to arriving back home to Florida the Saturday before Thanksgiving. Not only are we always met with wonderful food that Bett picks up from Peeble's BBQ ... but we know we have lots of boiled eggs to peel. I realize some folks might think peeling eggs is a silly tradition, but it really is an important part of our Thanksgiving. Out of all these things... you highlight the ones you have done, or in the midst of doing! Fun! Mine are highlighted in red! 9. Held a praying mantis - on a stick! 22. Hitch hiked - Bonnie & I did this without trying, remember? 62. Gone whale watching - those amazing orcas! For those of you that live near me ... have you heard about the new bakery opening in town? It is a gluten free bakery. It is called 3 Fellers Bakery. The bakery is currently opened and the storefront will be opening in a couple of weeks ... how exciting is that??? 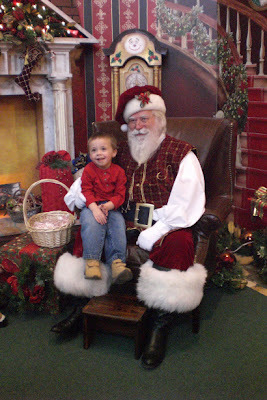 Santa Claus arrived at the local mall this past week so I took Griffin to share with Santa what is on his wishlist and to have his picture taken. He told Santa Claus that he wants a "Christmas train". Don't get me wrong ... I always think my little guy is a cutie ... but something about this picture just doesn't sit well with me. For one thing, I do not like that border, at all. 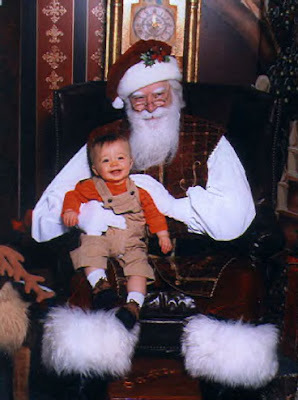 Griffin was being very shy, so Santa was trying to get him to smile. They caught this little "I'm not gonna smile for the camera look" in this picture. They have this sign up basically forbidding people to use their own cameras to take pictures. If I'm going to spend $30.00 on one picture, at least let me take another 20 (quickly) with my own camera so I get a picture that I truly like. We've gone to the same mall each year and the past three years it's been the same Santa Claus. This year, a new Santa Claus arrived ... I know that's part of why I'm disappointed too. Also, in the picture, all you see is Santa and Griffin ... yes ... I know ... they are the focus of the picture, but in years past they've also shown some of the beautiful background scenery in the picture as well. I guess I'm missing that. And ... Santa doesn't have any holly in his hat like the past three years. I loved the holly on the hat. 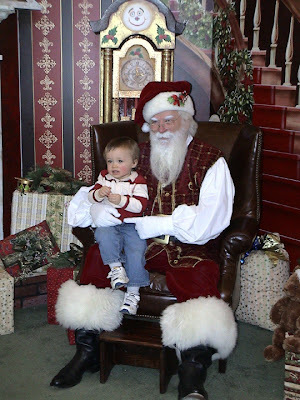 I think we may have to have do-overs ... maybe Uncle Santa will be available for pictures this year. 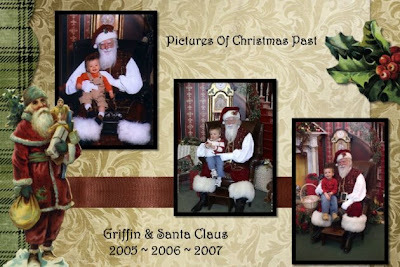 Allow me to share some Santa Claus and Griffin pictures from years past. I made this collage of his first three Santa pictures ... just thought I would share. Remember last week when I dared to show all of my gray hair?? Well, with my husband's help ... we washed that gray right out of my hair last night! I feel so much better today ... no more gray, and I have lighter locks! Mike knows how much better I feel about myself when my hair is colored. Thank you honey for helping me! Judi suggested I share a full faced picture of my colored hair ... this is what it looks like after I colored it. This is what it looked like before coloring ... it really doesn't look all that different, do you think? We had snow flurries through out the day yesterday ... and I was loving it! I have this complete joy every single time I see snow. I guess growing up in Florida, I will always be a southern girl at heart. We woke up to 19 degree weather this morning ... brrrrrrrrr ... I'm not so sure I'm ready for winter to come just yet. See the tiny little white specks? That is snow! And we pulled out Griffin's warm pj's ... he loves these ... he says they are "cool". He realized if he stood just a little closer to the fireplace it would warm his bottom. That made me giggle. Normally we have a gate up around it so a busy, inquisitive 3-year-old will not decide to see how it works. We will be putting it up today. Don't worry, we do NOT allow him to play on the fireplace hearth. While Mike was working hard on the porch on Sunday, Griffin was busy playing hard. The "baby swing" is still his favorite ... especially when I spin it around and around ... he says he's riding a helicopter. Griffin is into building things right now. He takes the scrap wood from the deck construction and here you can see him building a "house". And you know ... we all need to take a little time to dream and watch the clouds. Mike took advantage of the beautiful weather (though cold!) to get some work done on the porch addition yesterday. He works on this project every chance he gets. I'm so lucky to have such a wonderful, amazing and talented husband. I thought I would share a picture of the back of the house. The picture you see here is the original size of the house. And here you see the most amazing project my husband is working on. The smaller part of the addition (the part in the middle) will be my office/scrapbook studio. The bigger part is a two-car garage on the bottom and a master suite on the top. Can you see the green color on the top peak of the larger part of the addition? That's the color we will be painting our house. Here's a closer view of the addition in progress. When my parents-in-law were here in October, my FIL Ray and Mike worked together to get the framing completed. Mike is now working on getting it finished. It will be SO nice to have a closed in porch this coming spring to enjoy! Wow ... did we have a rainy, super windy Saturday. Mike was able to work on the deck/porch addition until about 2:00 and then we headed to town. We had to get the oil changed in Mike's company car. We made a stop by Walmart for some things on our must have list. Then we decided to make a stop by Toys 'R Us to get an idea of what they have to offer. And then, we went to dinner. We went to one of my favorite places to eat. Golden Corral can you believe that? Mike doesn't like to go there ... at all. I was truly surprised when he turned down the road to head there. I like the fact you can get salad, veggies, steak ... whatever you want, really. Griffin eats well there too. So, thank you honey for going to GC when I know you really didn't want to. I thought it was cute and decided to share it. My two sweet boys sleeping together in Daddy's chair the other night. Oh how I love these guys! I looked over at them and got one of the biggest giggles of my life. Mike was looking at his Craftsman Tool catalog and Griffin was looking at his Walmart Toy catalog. It was adorable. This is going to be a great Christmas ... this will be the first year Griffin "gets" it. He's decided what he wants Santa Claus to bring him ... care to guess what it is? Well ... looky there ... it's a John Deere Gator. Santa will need a pretty big sled to haul that to our house. I'm thinking Santa is going to deliver that straight to Griffin's door. Cars ~ he LOVES cars, he has 100s of them (literally! ), but he always asks for more cars. Helicopters ~ I blogged about the remote control helicopter Mike bought him a few months ago. Well, that thing is long gone, torn to shreds. He wants another one of those, but I told him he has to be older to appreciate it. Thomas the Train Set ~ he's really gotten into trains lately. He has four of the different trains, and believe it or not just the other day I finally bought him some train track ... lol ... I don't know what took me so long! Anyway, they have all of these Thomas the Train Trackmaster accessories that he has his eyes on. Trampoline ~ this is a Mommy wish for Griffin. I'm not sure if Santa will deliver one of these or not because he may still be a bit young for it. For those of you that know Griffin in real life ... you know how much energy he has. He loves to jump and bounce and I think he would enjoy a trampoline very much. Of course, we would get one with the sides on it. I don't know ... I'm still thinking about that one. Of course, we have to remember the most important reason for the season, Jesus Christ. We will display our nativity in our home and continue to teach our son the true meaning of Christmas.